I’m back home! It’s been over 48 hours since I even saw a Gartner analyst, let alone hear them give a prediction or presentation. Often when I go to these types of conferences, I leave all enthusiastic Afterwards, in the cold light of the home environment, I wonder what the excitement was about. This Gartner conference was different. There were some important predictions and trends that need to be understood and watched. I’ll describe just three. The first one is smart machines. It was fun to imagine what technology could create by combining iPhone’s Siri with Jeopardy’s Watson. For most of us, any help on personal organization would be welcome! More seriously though, these technologies will affect our lives; self-driving cars will improve the safety of driving. It made me think – could the use of these technologies helped to avoid the recent tragedies seen in the Lac Megantic, Que. train crash, or the recent bus crash in Ottawa? This affected me personally as my nephew was one of the six people who passed away in the crash in Ottawa. Could the accident been prevented if the bus would have used the technology that automatically applies the breaks before a crash occurs? Smart machines are the future and their efficiency and quality of life improvement are important trends that the Gartner sessions repeatedly emphasized. 3-D Printing was another technology that is well advanced. While it is now used mostly in prototyping, it will be used for special work such as custom part replacement in machinery. Eventually even healthcare will use this technology in the replacement of body parts such as knee replacements. 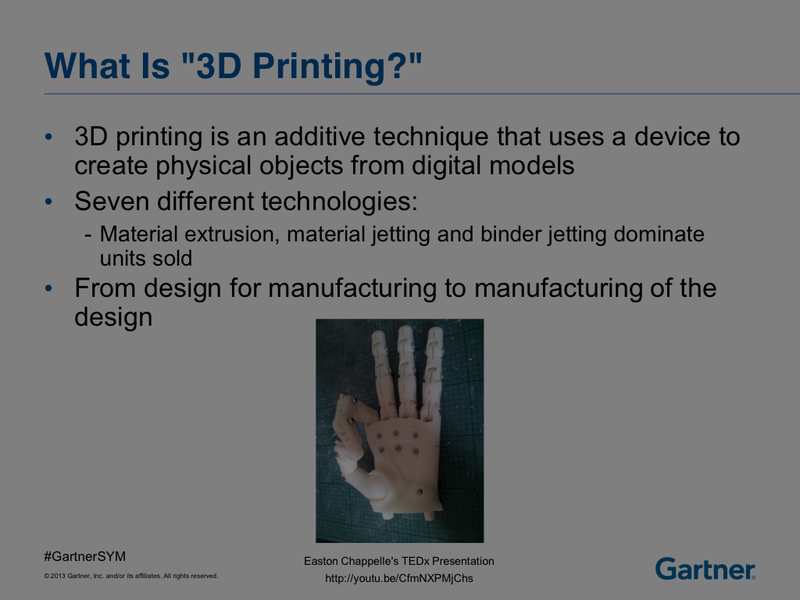 Gartner predicts that by next year worldwide shipments of 3D printers would grow by 75 per cent. This would be followed by an even greater increase in 2015. And of course there were many sessions about the digital everything: the Chief Digital Officer who will most likely be in marketing (digital marketing spending is increasing 50 per cent faster than traditional marketing); designing the “right” digital architecture; how to transform into a senior digital business executive; CIOs moving from technical manager to digital leader and many other similar topics. We also learned from one of the many Gartner factoids that more people have mobile access than safe drinking water. A rather disturbing statistic. And there was the vendor show. Lots of booths showing different technologies and services. I did talk to many of them and always asked as the first question: “What three things should I remember about your product and/or service?” You’d be surprised how many were stumped by this question but most answered after a bit of thinking. 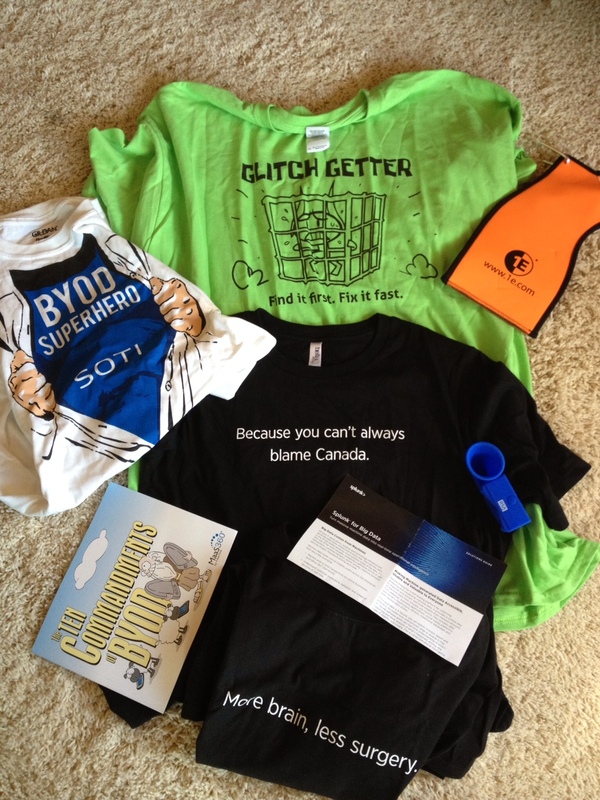 And there is the most unusual vendor IMHO, “Splunk for Big Data” who handed out black t-shirts with the saying “Because you can’t always blame Canada.” When I asked what was behind this, the guy in the booth said that they wanted something quirky on the T-shirts. Go figure! It is hard to organize such a large conference (over 9,000 attendees) and Gartner did an excellent job. While according to the Gartner survey of attendees the top three reasons for people coming to the conference were: learning more about customer relationship management, negotiating vendor contracts and network operations/ management – but none came for the food. 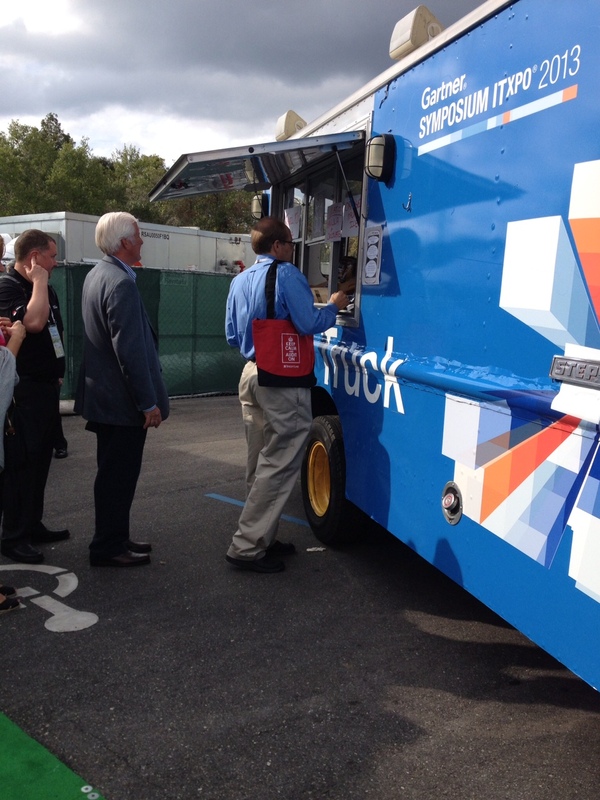 Yet the food was excellent and plenty, including food trucks that pulled up in the afternoons in front of the various hotels where the sessions took place to dispense chocolates, butter popcorn, ice cream bars, and other low calorie foods. They had rain coats when it rained, small lockable lockers where I could safely recharge my iPhone and iPad, shuttle buses, golf carts and bike carriers if you didn’t want to walk between hotels. I also observed an example of how the use of technology has changed. Gartner had set up dozens of laptops for people to use at the various conference venues. In the past there would be line ups to use these, but with the current “tablet revolution”, most went unused. During the five days of conference, I experienced over two dozen different sessions, visited about 50 vendors and walked (according to my Nike fuel band) about 80,000 steps or 47 kms, I get tired just looking at the figures. I’d appreciate your thoughts on the three main themes or any other part of my blog.